The Karambit born as a utility knife in the Indonesian archipelago with roots in Malaysia and the Philippines, and was, in all probability, a blade for agricultural use (presumably for agronomic grafts). Obviously this little tool could be occasionally used as a "improvised" self-defense weapon against an unarmed opponent. This knife, that traditionally has a fixed blade, in addition to its usefulness, was intimately connected with the local culture and religion, which embodied in "Pamacan", the great tiger of West Java, the spirits of the dead king. It is precisely from the claws of this animal that the Karambit draws its form and its magic. Used as ultima ratio, the Karambit turned into an excellent self-defense tool, ideal for targeting nerves and joints, making the enemy unable to try further attacks (hence the name of the technique "break the snake teeth" used in the Filipino martial arts). In ancient times, the cutting edge of this knife was contaminated with deadly poison (taken from plants or animals), which quickly entered into the bloodstream as a result of flesh tearing, making even deadly medium risk attacks. The knife, both originally and in modern versions, is distinguished by its characteristic shape that consists of several basic parts: the curved blade (which according to the village of origin may or may not has a kind of non-sharpened serrations -or barb- on the back) and the handle, which is also curved, terminating with a ring. Useful specifically as a self-defense tool in short distances, the Karambit has the advantage of being easily concealed and, for the knife structure and handle, it is more difficult to disarm. Definitely we must take into consideration the fact that the traditional European combat knives, generally with double edge blade, are more effective and able to infer lethal blows (besides allowing to maintain greater distances by the adversary); the small size of the Karambit don't allow this things, unless it is used with techniques that target vital parts most exposed (such as the neck). Modern versions of this knife, now internationally recognized as Indonesian Pencak Silat and Filipino Kali knife, are smaller than its ancestors, and are made even as folder knives. Today the Karambit, that is abandoned in places where it originated, is a tool used in the West primarily for martial arts training, thanks to the popularity of some illustrious character of the sector, such as Steve Tarani and Ray Dionaldo, that managed to raise this tool awareness in the world. For more information about the use of this blade in martial arts I involved a dear friend, Francesco Cotti, who has a 15 year experience in martial arts that goes from Kali to tactical blades employment, and he has made many seminars in Italy. He is also present on major Italian Internet platforms (forums and social networks), and he helped to popularize Filipino Martial Arts in Italy since the early years of 2000. He is the author of the first and most famous italian website about Kali (www.kali.it). Francesco, after having clarified me some points, explained that the Karambit is strongly arrived on international martial arts scene since only a few years (about ten years, that in relation to the secular history of the knife are few) and he told me that the vast majority of the techniques and systems based on this instrument are the result of personal study, conducted by Martial Arts practicing in South East Asia, with no particular concerns regard to original Indonesian techniques. In some cases, it has been developed some concepts that are really interesting, that goes far beyond the use of the instrument as edged weapon, but rather in the context of joint locks and immobilization tool. Francesco has also illustrated the importance in considering that the Karambit is a blade whose effectiveness is based on two fundamental concepts: it can be totally concealed until the last moment to surprise the enemy and the extreme simplicity of the techniques of its employment, useful only to disengage adversary. Today, unfortunately, these concepts are completely misrepresented in a "sensationalist" use of the Karambit. Traditionally, the Karambit has never been intended as defense tool against an opponent armed with a knife or stick; the original techniques were very simple and linear, in order to defend instantly from an attack. The Karambit was worn in a concealed manner at the navel level in order to be grasped with either the right or left hand, depending on the situation. The techniques were initially applied to enemy arms, then move onto the two effective targets for this kind of blade: the throat or the pelvic area (specifically the femoral artery). It was at most two or three well-placed cuts, before leaving adversary. The trajectories of use, in order to optimize the tip blade morphology, are circles portions, similar movements to circular punches. Karambit effectiveness is a wise use of footwork (the dynamic positioning of the feet / legs) to be placed immediately in a suitable posture to launch the attack. Finally, Francesco describes the Karambit as an "improvised force multiplier" to deal with an opponent unarmed, and not as a "main weapon". Lately there is the tendency to give a tactical/combat feature to this blade that on the contrary draws its origins in a kind of emergency remedy. Among the modern Karambit, the one that is closest to the traditional forms is born from the collaboration of Steve Tarani with the well-known American brand STRIDER. The HS Strider / Tarani, produced in 2002, has a double-edged blade of 9.5 cm, 4.8 mm thick, made of CPM S30V steel 59-60 HRc, with tiger stripe finishes. The knife, with full tang construction, is very strong and durable, and it has a weight of 153 g. The handle is sufficiently comfortable both in positive grip that in traditional reverse grip, thanks to the presence of not too pronounced finger grooves. The model shown in this post is the first produced by Strider, with green micarta handle and Tarani's name engraving. 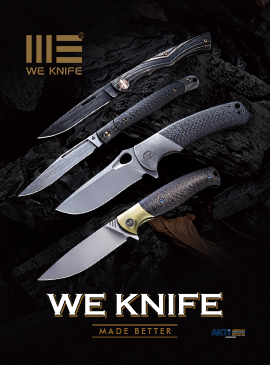 Later versions were also made with black finish blade and black textured G-10 handle. At the time of product presentation its price was around $350, today it is almost impossible to find on market. The Strider Karambit had been produced in 3 models: HS, PS and MB, which varied in size. 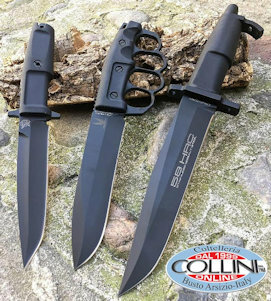 All knives are supplied with Kydex sheath with Velcro belt loop (in later models it has also Tek-Lok system). Unfortunately, the sheath realisation is of poor quality; besides being aesthetically unpresentable (considering the product price), the blade accommodation in kydex sheath is poorly dimensioned, causing scratches and marks on blade finish. It's a shame to see that one of the most famous American brands doesn't give much attention for this things, that have no small importance. Overall, the Strider HS Karambit is a good product, made with a very good steel and fairly finished. The HS is probably one of the most beautiful Karambit being realized until today.